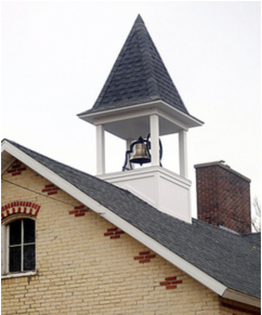 The bell used at the former New Groningen schoolhouse, at 10537 Paw Paw Drive, was returned last week as part of the Zeeland Historical Society’s restoration project. Brian Forde. The New Groningen schoolhouse renovation became one step closer to completion with the recent return of the school’s historic bell. Zeeland Historical Society members celebrated the return of the bell with second-graders from the current New Groningen Elementary School and their principal Jim Schoettle. The bell was removed from the old schoolhouse at 10537 Paw Paw Drive in 1952, a year after it closed, and had been kept at the nearby Sterken farm on James Street. Amy Langeland, a Historical Society board member, said the bell tower restoration was made possible by a $9,000 anonymous donation. The bell tower restoration is a part of the first phase of renovations to the schoolhouse. The initial phase, which began in September and will last through November, also includes demolishing the garage, replacing the front doors, and installing 7-foot windows with curved tops with contrasting red Veneklasen brick to resemble the original schoolhouse. The cost of the exterior work will total about $90,000. Langeland said the Historical Society also is hoping to raise about $45,000 more for additional exterior work to repair and weatherproof bricks and construct a parking lot. Langeland said phase two of the renovation will include interior work such as reconstructing the school’s coatrooms, classrooms, original tin ceiling, and hardwood floors. The interior work is expected to cost between $175,000 to $190,000. She said that work won’t begin until the Historical Society has raised the money. Historical Society members planned the renovations with GMB Architects. Neil Ruffner, of Ruffner Construction Co., is serving as the project’s general contractor. The Historical Society purchased the former schoolhouse, which had been converted into a duplex, about three years ago for $154,900. The two-room school was in use from 1881 to 1951. Historical Society members plan to use the renovated schoolhouse as a community meeting place, for educational programs, and a place to house the schoolroom exhibit currently at the Zeeland Historical Society/Dekker Huis Museum at 37 E. Main Ave.